They are called the Sandwich Generation and it's not difficult to see why. They are caught in a whipsaw between two generations, the one directly above them and the one directly below. The Sandwich Generation consists of Baby Boomers and some folks a bit younger who have to take care of both their pre-college age children and aging parents. And it is a daunting responsibility because both generations eat lots of sandwiches, and you're the one who has to make them! For the kids, you're pumping out family favorites like PBJs, BLTs, tuna fish, ham and cheese, and Nutella slathered on Wonder Bread at such speed and intensity you could almost fill up Chris Christie on a day that Donald Trump forgets to feed him. Meanwhile the aging parent is upstairs clamoring for a corned beef on rye. While busily shifting gears from young Arthur's BLT you accidentally schmear mayo on the corned beef. If your parent is over 80 and Jewish, it may well be a near cataclysmic event. Fortunately, support groups have sprung up throughout the country where you can share your worries and frustrations in a safe supportive environment and hopefully scope out tips on where to pick up day-old kaiser rolls and how to cut the crust off a tea sandwich without cutting off your fingers. 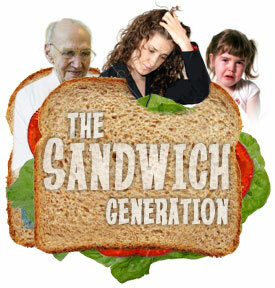 Ultimately there is hope for the Sandwich Generation. In time the kids will leave home and the parents will take off for greener pastures (i.e. they'll be dead) and there will be no more sandwiches to make except those you want to eat yourself. Then before you know it, you'll be on the tail end of the next Sandwich Generation with your kids frantically pushing out pbj's and turkey clubs to their unruly kids and garrulous old you. And you'll be wishing like hell you were back in the middle of this Sandwich Generation. I've been in the middle of the sandwich. Now, we are in those fleeting years that flash by in a nanosecond until we become the backside of the sandwich, made from the heel of stale bread pulled from the loaf just before mold set in. Think I'm gonna grab me a tuna fish sandwich and enjoy the last nanosecond or two. And I'll make one for you too, Gramps. You're too kind, Big Brother. Rye bread, if you please. What's In Your Wallet? or Why, This Isn't You!